Tedd Arnold—the guy who does Fly Guy—and his storyteller friends are bringing folktale tomfoolery into the 21st Century, with this Geisel Honor-winning companion to Noodlehead Nightmares. Although Mac and Mac are as hollow-headed as, well, noodles, they're always coming up with brilliant schemes. For instance, they're absolutely certain Mom will bake them a cake if they gather some firewood for her. But when their friend Meatball offers to trade them a handful of firewood seeds, the gullible brothers can't foresee what will happen next. . . 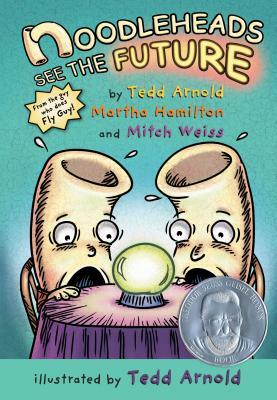 Illustrated by Tedd Arnold, whose Fly Guy series is a kid favorite, this graphic novel is perfect for comic fans and reluctant readers, with short, funny chapters following Mac and Mac through ridiculous adventures. Full of wordplay, jokes, and slapstick humor, the Noodlehead series is sure to delight. Based on traditional world folktales and stories of fools, the Noodleheads also encourage critical thinking, inviting kids to use their noodles– spotting the holes in the brothers' grand plans, and anticipating how things will go awry. Source notes from professional storytellers Martha Hamilton and Mitch Weiss provide more information about the traditional stories that inspired Mac and Mac's mishaps, showing how these comic motifs feature in folklore and legends all around the world and offering opportunities for further reading. This easy-to-read series is an accessible introduction to stories of fools, and a great next read for fans of the Fly Guy books. MARTHA HAMILTON and MITCH WEISS are the acclaimed storyteller team known as Beauty & the Beast Storytellers. They have won an Irma Simonton Black Award for Excellence in Children's Literature, two Storytelling World Awards, and an Anne Izard Storytellers' Choice Award. With more than 20 million books in print, TEDD ARNOLD is the best-selling author-illustrator of No Jumping on the Bed, Parts, Rat Life, and the Fly Guy series, including two Theodor Seuss Geisel Award Honor books..